During a few weeks in summer, the sun simply doesn’t set completely. It lingers on the horizon for a couple of hours, then begins to rise again. Circadian rhythms get all confused. Waking up in the middle of the night can cause a slight panic because the sky is so light, that is, until you glance at the clock to see that you can go back to sleep for a couple more hours. 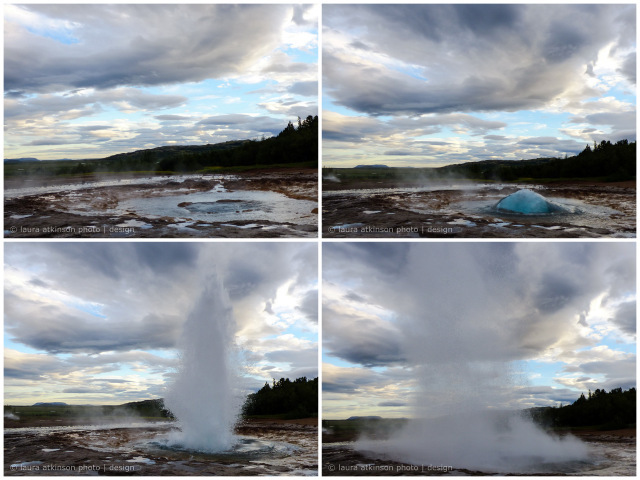 Geysir, aka as The Great Geysir, is in southwestern Iceland. 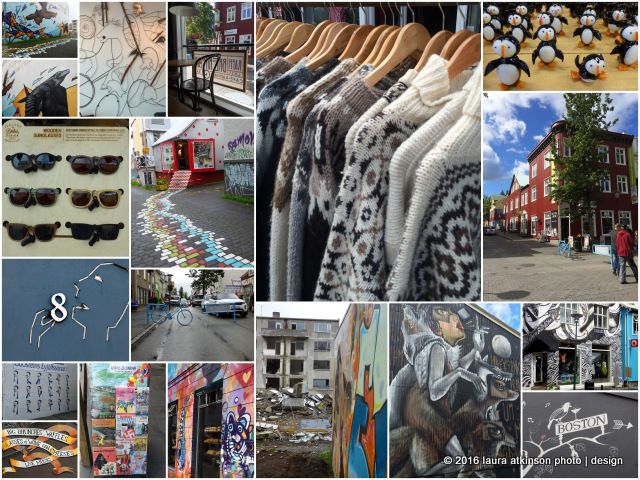 This series was made at 11:30 p.m.
A few afternoon scenes from Downtown Reykjavik —lots of tourist shops and funky art galleries… wool…in the summer…yes…you’ll want some. The graffiti on the buildings was commissioned. Each building represents lyrics to a song. It was part of a festival in 2011. There was some street improvements (aka construction) going on while I was there. I found that all the local stores were cranking 1980s music, especially Hall and Oats. 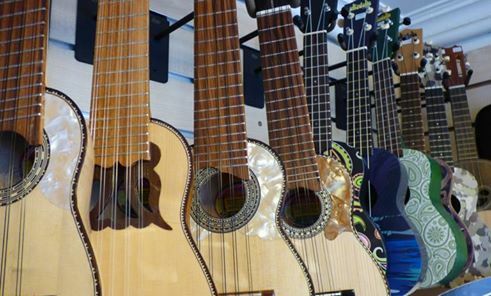 The exception to that was the World Music Store. They were playing steel drums and they specialized in ukuleles. The daily temperature in the summer reaches around 65 degrees, but in the evening it can dip into the 40s. As you can see, the weather can change rapidly, so be prepared with a coat with a hood. When the wind blows, it is always cold. As a local said — we don’t ever receive warm tropical wind here. Oh, and they declare a “heat wave” when the temperature goes above 60 degrees, and many businesses give their employees the day off to go enjoy the sun. I like this country. I like it a lot! 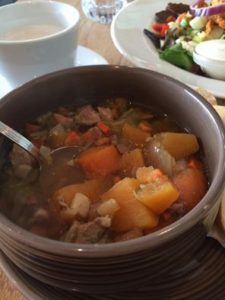 To warm up – try some traditional Icelandic Lamb Stew ( kjötsúpa) dip crusty bread and butter into the broth for the full experience. Every family is said to have their own spin on this recipe of mostly root vegetables and lamb. It was just the thing to have on a cold, rainy afternoon. *About herbs – Icelanders traditionally use herbs medicinally. They would use: Arctic thyme, birch leaves, bog bilberry, bilberry and juniper. Substitutes: parsley, thyme, bay, and celery. – Trim some of the excess fat off the meat, and cut into chunks. Place it in a large pot, add 6 cups cold water and heat slowly to a boil. Skim the broth, then add salt, pepper, onion, and dried herbs. Simmer, partly covered, for about 45 minutes. – Meanwhile, prepare the vegetables. They should be chunky, large enough that each piece is a separate spoonful. Add the rutabaga, carrots and potatoes to the soup, and continue simmering for 15 minutes more. – Add the cabbage and simmer for 5 to 10 minutes, or until all the vegetables are tender. Lift the meat out from the soup, and separate out the bones, sinew and excess fat. Chop the meat up into bite-sized pieces and add them back into the soup. If needed, add a cup or two of more water, and adjust seasonings. Let soup sit overnight for flavors to develop. Garnish with fresh parsley or chives, if available. Serves 4 to 6 as a main course. Adapted from “Icelandic Food & Cookery” by Nanna Rögnvaldardóttir, and “Into the North” by Inga Elsa Bergþórsdóttir and Gísli Egill Hrafnsson. 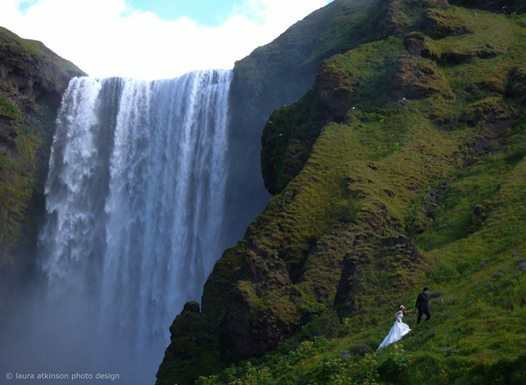 I’m not sure what impressed me more, the beauty of the waterfall, the distance this couple traveled to get this wedding photo, or the bride walking up a mountain in her white dress. 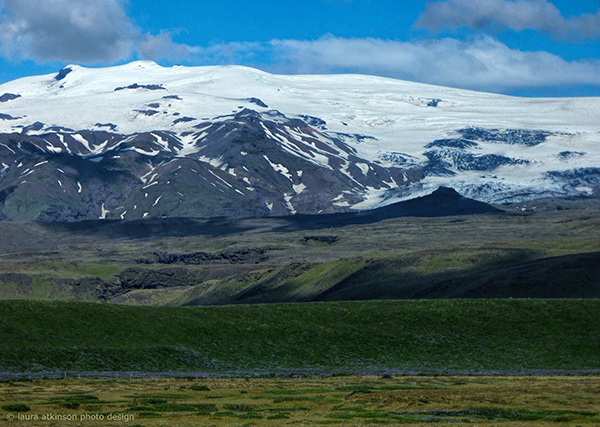 Eyjafjallajökull. This is the volcano that cause international airline problems in 2010. She’s quiet now, but her sibling volcano, Helka, is grumbling. Some of my favorite landscapes.